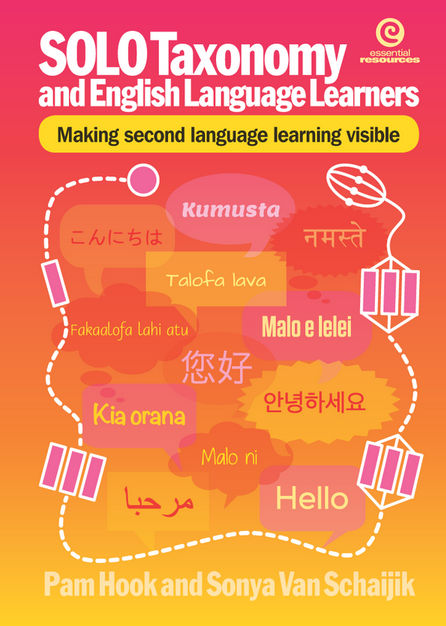 In Aotearoa New Zealand, Maori have a whakataukī about learning. Whāia te ara Poutama – Pursue the pathway of education and betterment. Poutama is the stepped pattern of tukutuku panels and woven mats – symbolising genealogies and also the various levels of learning and intellectual achievement. The pattern is often used in policy or in institutions to symbolise that learning happens in a scaffolded way. I have taken the idea and related it to my Hapara online learning this year. First I learnt what it was like to be a learner in the Hapara System and learnt how to work alongside other Hapara Champions in the world to complete course work when undertaking my Hapara Champion Certification. Next I learnt about the role of the teacher in learning and I learnt more about the importance of pedagogical and content knowledge in the Hapara Scholar Certification course. Now I am learning about andragogy and how adults learn so that I may better cater for the teachers that I work with while completing the Hapara Trainer Certification. My current assignment is to develop a philosophy around training tech to adults. However it has developed much more than that in me because as an adult learner I have made several links with my own learning and have made links with several online projects I have lead and been involved in. So in order to complete this assignment I have read several articles given to us on the course as well as searched further articles and videos to deepen my learning around adult learners. What follows is an unpacking of this learning. If you have time I would love to hear your thoughts about when you have worked with adults and let me know if what I have written is even close to developing a training teaching philosophy. I am particularly interested in your thoughts if you are registered facilitator or if you are an across school leader in a Kāhui Ako. However maybe you might also have been at the receiving end of professional learning and can contribute some personal thinking to help deepen my understanding around adult learning. As a course designer first and foremost is identifying the characteristics of the adult learner being helped and learn empathy for the learner by being an active learner too. Next, learn the subject well enough to enlighten the learner and learn the process of assessing the learners comprehension level. In addition it is important to understand andragogy which is all about how adults learn best and how different this is from pedagogy. Consideration must also be given to the stages of learning that happens as part of the process of learning. Finally as a course designer review previous courses and reflect on areas for change that better meet the needs of the adult learners. Pappas wrote about characteristics that exist (to some degree) in every adult learner and stressed the importance of understanding these especially in designing courses. Adult learners rely on their personal reservoir of life experience. For this reason learning needs to be immersive enough to compete with all the other distractions. Adult learners are ready to learn based on a need so if the learner sees that they are making progress or learning something useful, then they will stick with it. One idea is to provide increments of learning in the way of digital badges such as can be seen in Digital Packbags or in certificates that acknowledge course completion. Adult learners desire knowledge for immediate application and consequently require deeper functional knowledge that can be translated into everyday use. A key strategy is using self help videos that can be slowed down, paused and re wound depending on the rate of learning. Adults learn best when learning is focused on them, not the teacher. Learning experiences should be based around lived experiences, because people learn what they need to know. According to Malcolm Knowles, ‘Andragogy is the art and science of adult learning.’ Therefore andragogy refers to any form of adult learning. There is an excellent video by Janet Finlay that explains andragogy and can be viewed here. The video compares andragogy and pedagogy as well as explains the six adult learning traits developed by Knowles in detail. Below four traits have been highlighted. Adult Learner Experience: As a person matures he/she accumulates a growing reservoir of experience that becomes an increasing resource for learning. Readiness to Learn: As a person matures his/her readiness to learn becomes oriented increasingly to the developmental task of his/her social roles. Orientation of learning: As a person matures his/her time perspective changes from one of postponed application of knowledge to immediacy of application, and accordingly his/her orientation towards learning shifts from one of subject- centeredness to one of problem centeredness. Motivation to Learn: As a person matures the motivation to learn is internal. Mezirow, 1990 identified transformational learning as “The process of recognising, analysing and making deliberate changes to the assumptions that we have that cause us to think act and behave in certain ways.” Mezirow states that learning is a “process of using a prior interpretation to construe a new or revised interpretation of the meaning of ones experience in order to guide future action”. This type of learning occurs when one’s beliefs or “meaning scheme” changes due to new information and ideas. These changes may occur quickly, or take place over a longer period of time. Identification of a Dilemma or a Crisis: The realisation that we had all along been holding on to wrong beliefs or that we don’t know what we should know is often a trigger to dig in and unearth information or review our mindsets and thought patterns. Not knowing or realising that we have the wrong information is a crisis that is deeply upsetting to all of us. You have to point out to your learners what they don’t know to make them curious about your course. Establishment of Personal Relevance: This is the context or the answer to the eternal “what’s-in-it-for-me” question that inspires people and drives learning. The context can be personal, professional, or social, and you should establish it right at the beginning of the course to spike interest and reiterate it often to keep learners hooked. Adult learners are motivated to learn when they can envision the results of their efforts. Critical Thinking: Adult learners are sensible, rational people with minds of their own. So it is important to create opportunities for critical reflection (premise reflection) to encourage them to re-examine their beliefs and attitudes. When learners have the opportunity to sort through their feelings and thoughts and realise on their own what they need to shed or tweak, they will be more willing to accept and embed the learning. Teaching adults is really about understanding that learning is about good teaching. The more learners are actively involved, the better they learn. Words like self efficacy and agentic learner come to mind as well as ensuring that the task is as Hattie would say the “Goldilocks theory of Just right.” Good teaching is all about the learner being at the centre of learning and that the tasks are just challenging enough to motivate the learner forward. Course designers must actively involve adult participants in the learning process and serve as facilitators for them. Treat learners with manakitanga which is respect, understanding, and genuine concern. Adult learners need to know why they need to learn something so ensure that there are well-defined objectives. Adults approach learning as a problem solving and they learn best when the topic has immediate value. Therefore establish clear directions based on the adult learners needs. Adults learners learn experientially so ensure that content is meaningful and transferable to the adult learners’ world. Adults learners approach learning as problem solving so provide opportunities for them to work together and to share their knowledge and experiences. Help adult learners to see their learning by providing incentives to earn badges, certificates and to reflect on their learning. Also give them opportunities to give feedback to the sessions because feedback is a key action expected of all learning. Hattie, John (2008). Visible Learning: A Synthesis of Over 800 Meta-Analyses Relating to Achievement. NY: Routledge. Mezirow, Jack. (1991). Transformative Dimensions of Adult Learning. San Francisco: John Wiley and Sons Inc.
Next week we celebrate Chinese Language week. My school continues to experience much change over the last ten years, particularly in the demographic makeup of the school. Our total Asian group has increased in the last decade from 43% in 2007 to currently 68%. At present our biggest ethnic group is Chinese children who make up 26% of our school role and that number has nearly doubled in 10 years. So particularly for them we celebrate Chinese Language week and this gives us the opportunity to find out more about our children, about their language and to learn something about their culture. This year Monday 24th of September is the celebration of the Moon Festival. Chinese tradition celebrates the moon festival as the culmination of harvest. This is when the moon is the brightest in the sky. The day is celebrated with family coming together and much preparation is undertaken with the food delicacies prepared. One of these is moon cakes or 月饼. Making moon cakes is to do with the story of Houyi and Chang’e and story goes that moon cakes were one of Chang’e favourite delicacies. I usually retell the following story of their love. The story of Houyi and Chang’e. Legends are like the shifting sands of a desert. This legend is no different, and there are many versions. But this legend is special because it is retold by Newmarket School. The Jade Emperor was ruler of Heaven. He had ten naughty sons. One day, they changed themselves into ten suns. They burnt the earth from high up in the heavens. Unable to stop them being naughty, the Jade Emperor called for Houyi. He was an archer known for being a straight arrow shooter. The emperor told Houyi to teach his sons a lesson. Houyi, was a half god and was very strong. He came to Earth and saw its suffering with his own eyes. Everything was burnt and there was not much life, and the people were in pain. Houyi was angry. So he acted. He took 9 arrows from his bag and aimed at the hot suns. First one fell down, then another. In the end, nine of the Jade Emperor’s sons were dead. Houyi left only one sun alive, to give the earth light and warmth. When he heard the news the Jade Emperor was furious. He sent Haouyi and his wife Chang’e from Heaven. The emperor took away all their powers. They were now forced to live on Earth like ordinary people. The pair found human life hard. Houyi had a single wish. He wanted to return to heaven with his beloved wife. She did not need to suffer. Fortunately, Houyi remembered that the immortal Old Mother of the West, who lived on Earth. She had a rare supply of medicine that could let them live forever. The hopeful archer left to find her. He reached her palace and met the Old mother. When the Old Mother of the West heard the story, she gave Houyi two things. One was the medicine and the other was a warning. She told Houyi to share the medicine with his wife. Drinking half the medicine will let him live. The entire medicine will let him live forever and send him to the heavens. Houyi thanked the old mother. When Houyi returned home to his wife Chang’e, she was very happy. While her husband rested from his journey, Chang e could not resist looking at the medicine that he had brought back. She really wanted it and so she drank up all the medicine. Before long, she felt her body grow sleepy, and she began to float into the sky against her will. Because the jade emperor had banished her, she could no longer return to heaven. Earth was now beyond her grasp as well. With nowhere else to go, Chang’e drifted to the lonely Moon. She coughed and there was a little bit of medicine left. It changed into a rabbit. She spent the rest of her days in the lonely moon palace with the white rabbit. She cried for her husband Houyi. But he was had to live the rest of his days on Earth as a man. Chang e looked down on Earth and could see her husband with lots of delicious food waiting for her. Now each full moon you can see Chang’e with her rabbit against a blossom tree calling out to her husband on Earth and hoping he is still waiting with a feast for her return. This year some of our fundraising leaders asked if they could make moon cakes and I agreed to help. So I thought I would share our recipe with you. Our recipe has the sweet red bean paste filling 红豆沙. 50 mls of Peanut Oil or vegetable oil. Extra flour for kneading and to stop mixture sticking. Mix golden syrup with alkaline water and vanilla essence, mix well using a spatula. Make a well in 200 grams of flour in a large bowl. Pour in Golden syrup mixture and mix well (Mixture should look wet and sticky. Cover mixture with plastic glad wrap, leave for 3 hours or more. Knead the mixture until it is smooth and shiny. Divide the mixture into 4 even pieces. Then divide them into 4 smaller balls, about about 25 grams each. Roll them into balls and set aside on a piece of greaseproof paper. Roll the red bean paste into 35 gram balls ( A little bit thick and sticky). Flatten the brown balls so they are nice and thin. As you work the ball the oil is warmed by your hands and you can do this easily. Place a red bean ball mixture inside and pull up so that the red bean ball is covered with the flour and golden syrup mixture. Set these aside. Continue with the rest of the mixture until you have 16 balls. Use a traditional mould, and brush on a little flour. Then press the mixture into the mould. Use your palm to gently flatten the top. Tap the mould against the table and the uncooked moon cake will pop straight out. When they are all done, spray water over the cakes. Bake at 150C for 10 minutes. Take out of the oven and cool for 10 minutes. Brush on beaten egg and put back into the oven for 15 minutes. They can be eaten immediately or put in a tin for a few days. I made the pastry skin mixture the night before. The next day it took us nearly 1 hour to craft the moon cakes. If you measure the balls well there should be very little left over. Nurture the seed and it will blossom. Our #NPSFab Team in our new meeting room. Teachers do not need fixing and our students will achieve just by breathing. There is not much we as teacher can do to learners that harm them. As I watched the clip I noticed all the questions John asked which is currently relevant in my situation of leading the Mathematics Initiative in our Auckland Central Community of Schools (ACCoS) Kāhui Ako. Mind you all that Hattie talks about is relevant for all teaching and learning. Below are some of the questions that resonated with me. How do we know our impact? How do we build the expertise around us? How do we build the coalition of the willing and of the successful to have a major say in our schools? How do we get a ladder of excellence in our business of teaching? How do we get away from the common notion that all teachers are equal? How do we demonstrate the impact we are having on our students? How do we give back to our teaching profession? How do we get our teachers involved in helping each other up the ladder of excellence? How do you know that your students are achieving? Have you scrutinised their data? Can I see their extrapolated data from our student management system? If you are not prepared to be a learner then why are you still teaching? If I cannot see what you do then it does not exist. How are you sharing your learning with your colleagues? Hattie has been extremely visible in my recent learning. I have just completed my Hapara Champion Scholar certification and I was delighted to find out that the system designers had created a Student Learning System based around the research of Hattie about what works in education with the greatest impact. This is particularly noticeable in the tool Hapara workspace. Then I shared at one of our Cluster Schools about using SOLO Taxonomy which Hattie has stated is a sound learning structure because SOLO highlights the gaps in learning. On Thursday I pressed submit for our Ulearn 2018 abstract. This abstract involves the work we have been carrying out in our three schools with a focus on the learning strategies that have the greatest impact. Yesterday I took three of my colleagues to Mindlab to share their learning around gaining their Digital Passports in preparation for the Digital Technologies Curriculum that will be taught in schools by 2020. Then to stumble on Hatties Ted Talk allows me a chance to reflect on my current situation. I continually struggle at his class size data and have often wondered about some of my class sizes. For example as a young teacher one of my first classes had 38 children. I recently uncovered information about my current school where teachers at the beginning of this century had class sizes of just over one hundred students. I am reminded of my own class in Samoa when I was in standard 2 (Year 4) where my teacher had 48 of us in class. Below are some of the effect sizes that Hattie highlighted in his 2013 video. This is not all of them but I wanted to highlight the ones that caught my eye. Currently these are the ones that we discuss regularly at our school and within our Kāhui Ako. However Hattie points out that these do not have enough of an effect size to make an impact on teaching and learning. Remember that .40 is a years effect so anything below that number makes very little difference. Basically the distractions we put out there as teachers that affect learning are a big no and have little effect on what we do. Interestingly as a Kāhui Ako initiative we have recently created a student survey that focuses on student attitude to maths and their learning in maths. We had high numbers that stated they love learning online with a device and loved learning with their friends. One clear high number showed us that students loved their teachers telling them that they are doing well in maths and that they loved their teachers playing maths games with them. They also love being tested by their teachers. I am still evaluating the data with our In School Leaders. So Hattie states that the greatest variance that has the greatest impact on student achievement is teachers who work together collectively who evaluate and understand their impact. The teacher’s job is to understand their impact. He talked about expert teachers and reinforced that teacher expertise is not highly correlated with years of experience. Teacher impact is the importance of knowing where each student is in order to challenge them. With the ongoing debate around National Standards, just be cautious about chucking out all assessments. Because National Standards has a lot to do with assessment. Yet it is really important to know where the students are at with their learning and the only way of doing this is with assessments and understanding our curriculum levels and what this looks like for our students. Personally I know assessments are challenging to complete and have up to date. But if I do not know where my learners are at, then how can I help them? Yes I can provide lots of creative learning experiences yet I must keep my eye on the prize. Keep developing the love of learning and keep moving my learners forward. Reinvesting in learning for our students. The starting point is for us to understanding very clearly what the students know already and we do this via assessment or by asking our students about their prior achievement either through a portfolio of learning or what their last score was.Then we need to know what success looks like and we do this via the learning progression framework. We show our learners up front what success looks like and the more we can show what success looks like the more engaged our learners are and the more they love learning. We can use SOLO Taxonomy to support us in framing what success looks like because SOLO helps us structure feedback and identify next steps information. We provide multiple opportunities for ‘just right’ learning using deliberate feedback to reduce the gap of where they are to where they want to be by using the Goldilock principle of not to hard and not too soft, but just right. Therefore our students are continually targeting or goal setting as they move forwards. Outcome is increasing the success. So often the learner does not know what success looks like in the series of lessons of lessons we plan for. So often the learner does not know what the goal of the lesson is. Remember the olden days of stating the learning intention and sharing the success criteria? I often thought that this was more for the teachers than for the students and it was. However we must not lose sight of its relevance. If you don’t know what the goal and outcomes for the lessons are then how the heck will your students? In my school where we have a sense of urgency for our second language learners aiming to catch a moving target. I believe it is even more important to know where my learners currently are and to identify the target cohort they are catching. If you are new to all this then my advice to you is you will have some failures. But fail well, reflect and use this information to move forward. As schools we must create a climate of trust that it is OK to make mistakes and errors as professional. However we must provide feedback to our teachers about their impact. Again the best way of gauging our impact is via data. The point of gathering assessment data is for teachers to understand their impact. A second language learners reading data over a year. If we keep failing in shifting our learners forward then we are failing our learners and their families who have placed their utmost trust in us as professionals. At my school this is even more important because of the sense of urgency for our learners. I continually look at data and I love data that stands straight up heading to where it should be. Data that stands like a line is accelerated learning. I especially pay attention to historic data because I know that data gathered over one year is not clear enough to predict learning outcomes. We must teach our students the effective learning strategies so that they can deliberately practice with us and coaching to reduce the gap from where they are to where they want to be. That is how using SOLO helps us. If you read Pam Hooks site of how to teach with SOLO Taxonomy you will see these three simple statements. Our third code of professional responsibility is to the teaching profession. So how do we encourage our expert teachers who understand their impact to give back to their profession? How do we structure this into their learning and get them involved in helping others up that ladder? For us involved in the ACCoS Kāhui Ako Mathematics initiative I have encouraged our In School Leaders to join me in sharing their impact at Ulearn 2018. By involving them in the process of sharing in such a public way I believe they will help others within their school share their learning. I also encourage our Across School Leaders to continue their sharing via our ACCoS blog. For our In School Leaders at Newmarket School we have created a Hapara Workspace to curate and share our learning from our professional learning groups with a focus on maths. This is visible to everyone and you can check it out here. http://j.mp/2FyK0xU. Overall teacher impact begins with data to show where the learner is at. Then we use the Learning Progression Framework to identify where they need to be and we use SOLO Taxonomy to show how they can get there. Next we use just right goal setting and just in time feedback to propel them towards where they want to be. After that we have our students talk about the process of learning. Finally as educators we share our own journey with our colleagues and include our mistakes and our achievements and our own next steps as educators. We encourage our colleagues to do the same. I have struggled to find a one word for 2018. Over the past few years I have taken a Maori word and spent the year unpacking concepts that underlie what the word means. However this year I have struggled to find another ‘kupu’ that spoke to me. Recently I realised why. Because I had not fully grasp what my 2017 one word, Tūrangawaewae was. I accept that and will continue to spend this year unpacking what it means. Recently I returned to Samoa for a family funeral. But again it ended up being much more than that. It was a chance to visit the land of my birth and spend time with my eldest son. He and I ended up having lunch with Tupua Tamasese and his Masiofo Filiga. The discussion led me to come back and read some of his latest publications. One that caught my eye was his Keynote Address to the Samoa Law Society & Te Hunga Rōia Māori o Aotearoa Joint Conference in July 2016, Apia, Samoa. Tupua spoke about ‘Tulaga vae’ in his address. He spoke about the the concept of “tu” as in “tulaga vae”, meaning the place where one stands and how aga is the concept that alludes to the old ritual of burying one’s pute (umbilical cord) and/or placenta (fanua) in the land of one’s birth. I love how all the connections click into place as I have previously shared how my pute is buried under the pulu tree in front of the house where I grew up. This is literal because again the reference is about the place that shaped me. Once I read this I realised my understanding about Tūrangawaewae was still shallow and I knew why. I had not made connections using my Samoan language. On Friday, we were in our new staff room and no our building is still not finished, but we are getting really close. Wendy, our principal pointed out an etching on one of our glass panels. I squealed with delight. It was Te Ti Tutahi. We have a link to our past in our new building. Te Ti Tutahi stands again. Newmarket is central to all our schools in ACCoS, Auckland Central Community of Schools. So knowing about Te Ti Tutahi, a notable tree of the area, is also important for our Kāhui Ako because Ngāti Whatua are the Maori of the of our area. The historical name for Newmarket is Te Ti Tutahi. Te Ti Tutahi literally means the single Ti or Cabbage tree that stands alone. However Te Ti Tutahi was much more than that. The tree was significant for Ngāti Whatua, Maori of the area. Te Ti Tutahi was the tree where the whenua (placenta) and pito (umbilical cord) of newborn babies were buried. The placenta was placed in a specially prepared receptacle and buried in the roots of Te Ti Tutahi. This practice reinforced the relationship between the newborn child, the land of Aotearoa and the area where they were born. Therefore Te Ti Tutahi te ingoa wahi, means Ti Tutahi is the sacred name of Newmarket. I have spent a long time talking with Jane Kaa who was Deputy Principal at our school when I first came to Newmarket School. Jane was the person who first alluded me to our school having a massive history. Over time I have curated and gathered every piece of written records that I can source digitally and placed links to one place. One major piece of information was Te Ti Tutahi. Ngāti Whatua call Newmarket, Te Ti Tutahi. However our school uses the Pohutukawa for our emblem. That is because we are surrounded by these beautiful trees. Our uniform is based around the colours of the Pohutukawa. Even our new building is red. Yet these trees were not there fifty years ago so in reality they are a much more recent addition to the area. Historically as a school nearing 150 years there have been huge changes. For example we used to be where 277 currently sits. In the early part of the 1900s, the stories go that the principal had the ‘old’ cabbage tree cut down because he was sick of the rubbish the leaves made. I found a reference to the cutting down incident dating 1913, in papers past. However regarding the principal, these are stories passed down. I carried out further investigations and found out that F. J. Ohlson was the principal of that period. He left Newmarket to be the F. J. OHLSON principal at Maungawhau. I have taken images from the old buildings and placed them strategically so you can see how it might have looked. These are all my guestimates and I have studied heaps of photos, maps and read so much about the area. If you can visualise Mortimer’s pass as a bullock track, with Te Ti Tutahi at the bottom. When I look now I realise that the building did not take up that much land and was probably more than generous in its dimensions. When Te Ti Tutahi was cut, all the remained was a stump. 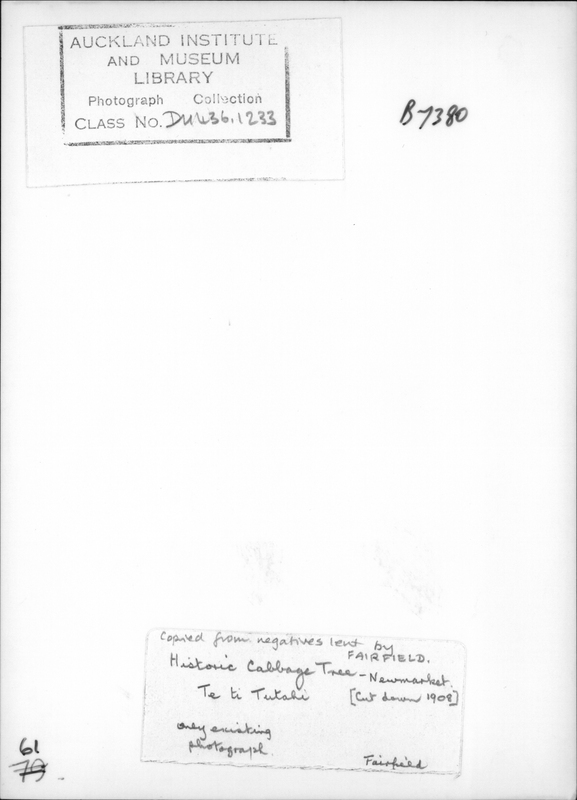 I also found 1908 was the date referred to o the back of one old image located in the Auckland Museum Archives. When you visit Highwic House in Newmarket, you can see some of the descendants of Te Ti Tutahi planted in the gardens by Bucklands children. This photo of some of our past students taken in the grounds shows one of them in the background. At Newmarket School, Wendy Kofoed our current principal collected shoots from Highwic house when she was first principal here and planted them around our school. Unfortunately we had to get rid of two trees for our new carpark. But as you come up the stairs past the pohutukawa tree you will still find a magnificent specimen growing. Over the years I have paid attention to this tree and observed its cycle. I have watched Tui coming and drinking from the flowers or or sucking the fruit. I watch for the flowers because this turns the tree into something absolutely spectacular and I become excited at the changes that take place, kind of like markers of nature. Sometimes teachers ask me to come and tell stories about our school and I always talk about Ti Tu Tahi and its significance for the area. I share about how we have Grandbabies growing in our school and how we must take care of them as they are links to our past. I often take photos of the one by the stairs because it really is just a magnificent tree and wonder about the devastation to Ngāti Whatua when one of our old principals just chopped down the tree with little regard for its significance. But probably more out of ignorance and naivety than anything. At the same time, this story is part of our school’s history just as Captain Cholmondely Smith, our first school principal, used to fight in the Maori wars and heaps of our children died in the first and second world war. To me Te Ti Tutahi is Tūrangawaewae. At my school of Newmarket I must applaud Wendy for ensuring that the memories live on in our school and with our children. As our children pass through our school, many have come from a different country and have their whenua and pito buried there. Therefore even though they now live here they still consider the land of their birth their Tūrangawaewae and we must not forget that. Just like one cannot ask me to forget Samoa because it is my island home and my tulaga vae. We cannot simply change back our current school emblem to reflect Te Ti Tutahi however we can incorporate the memories and stories as we move forward. Just as we must remember and acknowledge our historic motto of ‘Not self, but service’. Just as we must also acknowledge the Tūrangawaewae of all of our learners. Somehow we must embrace and acknowledge the languages of their birth and ensure that all students have strengths in their own cultural identities. We must incorporate both into all that we do at our school. Therefore by acknowledging the significance of Tūrangawaewae of all our learners we bring into our teaching and learning an understanding of who they are, their families and whānau, their language, their culture and develop our own empathy about the challenges they face coming into new lands learning a new language and learning new ways of being. Together we learn about Ngāti Whatua, the Tangata Whenua of our area and learn about their Tūrangawaewae so that together we can move forward and grow in our understanding of Tūrangawaewae because after all the next generation have birth places in Aotearoa as their Tūrangawaewae. Efi, Tui Atua Tupua Tamasese Ta’isi. “ ‘Where Is Our Island?’ Navigating Language, Vision and Divine Designation in Samoan Law and Jurisprudence.” Samoa Observer, 10 July 2016, www.samoaobserver.ws/en/10_07_2016/local/8480/‘Where-is-our-Island’-Navigating-Language-Vision-and-Divine-Designation-in-Samoan-Law-and-Jurisprudence.htm. Simmons, D. R., and George Graham. Maori Auckland. Bush Press, 1987.